Every divorce is unique. Divorce and legal separation cases can range from simple agreements to complex litigation with millions of dollars in property and assets including difficult child custody issues. With over 25 years of experience, The Law Offices of Jon D. Rigney, A.P.C. has successfully handled thousands of divorce, legal separation and family cases of all types and sizes. We have handled hundreds of cases for military personnel and their families. Our experience includes many international cases and we have represented people from all walks of life and all over the world. That’s why we know, and you should feel confident, that we can handle your divorce or legal separation successfully. We have experienced paralegals and attorneys standing by during normal business hours to give you more information about our firm and to discuss the specifics of your case. Please call us at 619-236-0533 for a no obligation consultation. Most divorces are ultimately uncontested, which means that they end in a negotiated settlement. Divorce and legal separation should be a simple and straightforward process; and for many people it is. Whether a case will be settled quickly and amicably, or hotly contested, has much to do with the personalities and emotional state of the people who are divorcing or separating. Everyone going through a divorce either has, or will, go through the psychological process of grief which makes it more difficult for some people to settle quickly or easily. California law requires both family law litigants and their attorneys to act in good faith to attempt settlement whenever possible. We at the Law Offices of Jon D. Rigney, A.P.C. take this obligation seriously. An experienced attorney can increase the possibility of an amicable resolution by being aware of this process and working to reduce conflict whenever possible. While most divorces and legal separations ultimately settle without a trial, many have litigation along the way. Because of the emotional and psychological outlook of people going through the process, all divorces and legal separations have the possibility of conflict. Therefore, when it is in your best interest to do so, or your case requires it, we are well equipped with skill and decades of experience to handle contested court proceedings. 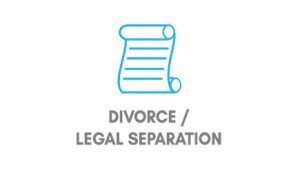 We are experienced in handling all issues which may arise in your divorce or legal separation, both contested and uncontested, including division of assets such as retirement, real property, valuation and division of business interests, child custody, child support, spousal support (alimony) and division of investment accounts. We can obtain immediate orders to prevent removal of a child, to prevent cancellation of insurance and preserve bank accounts and other assets from being liquidated. We can obtain emergency orders to assure that you and/or your children will be able to remain living in your home and have the support you need while your divorce or legal separation proceeding is being resolved. Not everyone in need of legal assistance with their marriage should or will file a divorce. Because you can get the same orders in a legal separation case as a divorce proceeding, many people with marital problems who do not necessarily want to make the decision to divorce will file a legal separation proceeding. This will allow you to get the court orders you need for support, your children and your assets, including emergency orders, without having to make the difficult decision of whether you want to divorce. Many people file a legal separation proceeding as a “wake up call” to a spouse who is behaving badly. It is not uncommon for people to have conflict in family law matters which takes place months or years after their judgment is final. These types of matters commonly involve disputes over child custody, child support and/or spousal support (alimony.) Due to the need for pensions to vest, often issues regarding division of retirement cannot be finally resolved until years after a divorce or legal separation is final. Sale and/or division of real property might be delayed until after a final judgment. These are all issues we can help you resolve. The resolution of your divorce or legal separation will affect your financial well-being for years to come. If you have a long-term marriage, the resolution of your case may impact your finances for the remainder of your life, not to mention the very structure of your family if you have children. Having an experienced attorney minimizes the likelihood of conflict, because an experienced attorney will spot potential issues before they arise and address them with a proactive plan of discovery and negotiation. Thorough preparation and research will not only be more likely to bring your opponent to the settlement table, but should your spouse insist on litigation, our skill, experience, preparation and research will vastly increase your likelihood of a successful outcome. California family courts are empowered to award attorney fees in divorce and legal separation proceedings based on the ability of one spouse to pay and the need of the other spouse. The policy of the law in this state is to provide both parties equal access to counsel. Whether you are likely to receive such an award can be an important part of your decision to hire an attorney. If you are likely to be ordered to pay such an award, you should get legal advice to understand your exposure before you begin to litigate or negotiate your case. Please call for a live, no obligation telephone conversation with an attorney or paralegal at 619-236-0533.